Located at the western edge of the Oxtongue Lake bridge near Algonquin Outfitters Road you will be able to imagine what it was like to be AJ Casson painting “Early September, Oxtongue Lake” in 1969. This plaque mounted where it was created, depicts the actual painting and allows the viewer to see first hand the vision and results of A.J. Cassons interpretation of the this particular landscape. The plaque also includes quotes and other factual information on the painting as well as AJ Casson. Currently, “Early September, Oxtongue Lake” hangs in the Ottawa Art Gallery in Ottawa. The Tom Parris Memorial, a large rock with a bronze plaque, is located by the Oxtongue River to honour a beloved, local Forest Ranger. There are many heartfelt stories of Tom and his wooden fire tower and cabin located near the mouth of the Oxtongue River. 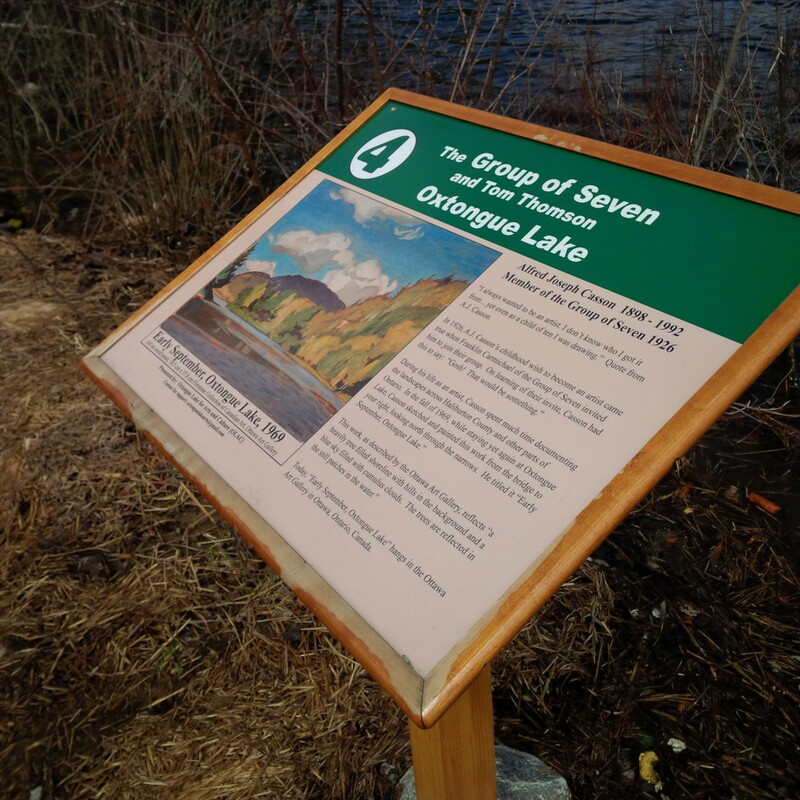 A full reading of his history can be found in the book Facts & Fables of Oxtongue Lake but Wilbur Blackman has provided a brief story of his own interaction with the local hero. “Tom was a very kind and beloved man. He had a cabin at the narrows where the Oxtongue River flows into Oxtongue Lake. It was a one room cabin with a porch. As I remember it, the walls and furniture were “navy gray.” We had several “picnics” with Tom and Pearl when we were kids in the early 50’s. I’ve enclosed a picture taken at the cabin in 1952. Tom also had a cabin at the base of his fire tower. As a teenager, I climbed to the top with great fear and trepidaton. Folklore was that ALL the animals knew Tom and LOVED him. “Sometimes when his “shift” at the tower was over, he would paddle to Lewis Camp (we could see him gently gliding through lake water toward our dock). We would all get excited and run down to meet him. He was a very jovial person and had a great laugh. (He would have been a PERFECT Santa Claus) He loved kids and would put us on his lap as he told stories. Usually one of his sons or cousin would come pick him and Pearl up, and they would go to their home on Highway 60 just east of Henrietta’s.